Dingoes (Canis lupus dingo) refer to wild canines that reside in the land Down Under -- Australia. They also inhabit southeastern regions of Asia, including Thailand. The carnivorous dogs are capable of surviving in many types of living environments. 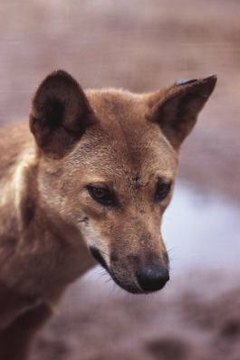 Population-wise, dingoes are "vulnerable" animals. Dingoes are classified as being a vulnerable group, reports the organization the International Union for Conservation of Nature Red List of Threatened Species. They are not considered to be endangered. The vulnerable classification is a result of their dropping population, largely due to breeding with domestic canines. While this interbreeding is common, dingoes are still plentiful in the wilds of Australia and in Asian parts of their geographic scope. It's often difficult to evaluate how many pure specimens are out there, however, as many of the mixed individuals look the same. Breeding with domestic canines isn't the only risk to the continued strength of dingoes in the wild. They are sometimes hunted by humans for their scalps and their skin. Some people in the United States and Australia breed dingoes for the pet trade. Dingoes are thought of as nuisances in some parts of their stomping grounds, and therefore occasionally face regulation methods. All of these factors might contribute to the falling numbers of dingoes out in nature. Conservation efforts for saving dingoes are in motion throughout Australia. The dogs have government protection in parks and wildlife sanctuaries throughout the nation. Several organizations in Australia also focus on keeping the dingo population strong through a combination of informing the public about the dogs and organizing the captive breeding of pure individuals. It also is unlawful to keep pet dingoes. If you happen to be in an area that is within the dingo scope, you just might spot one of the wild animals. In Australia, they're prevalent in woodlands and mountain settings, often far away from urban landscapes. They can adjust to many types of habitats, whether rain forests, arid deserts or wetlands. In Asia, they're frequently seen close to human dwellings. The dingoes watch over residences and the people return the favor by offering them regular meals. Adult dingoes typically weigh between 22 and 33 pounds, with lengths between 3.5 and 4 feet. Their fur is usually reddish or yellowish, although some specimens have beige and black coloration. They have narrow builds. Other physical traits of dingoes are sizable ears, wide heads and short coats. Visually, they are highly reminiscent of domestic dogs, although barking is uncommon in dingoes. Avoid getting close to dingoes, as the inquisitive creatures can sometimes be hazardous to humans, occasionally biting them.